How to Compress Pictures in Microsoft PowerPoint 2013? This article will explain how to compress the pictures in your power presentation slides in Microsoft PowerPoint 2013. Microsoft PowerPoint includes a feature that lets the users to compress the pictures in their presentation and thus reducing the size of the presentation file. 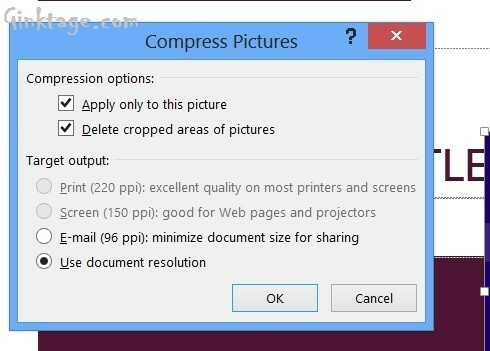 To compress picture in PowerPoint 2013, follow the below steps. 2. Select the picture to compress. In the Format tab, click the Compress pictures button. 3. In the Compress Pictures Dialog, Deselect the “Apply Only to This Picture Option”. This will compress all the pictures in the presentation and then select the Target Output Option which will set the compression settings such a way that the image quality will still be good. 4. Click OK and then save the presentation file.